Oh... what do you do in the summertime? "Oh... what do you do in the summertime"
This past week we all had a taste of my childhood...we played in the pool! 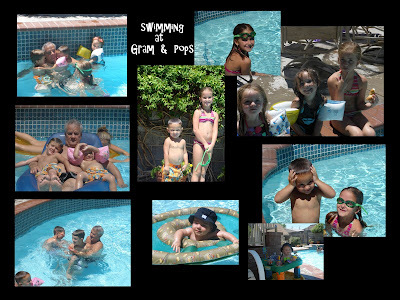 Growing up in St. George (with its 110 degree days) summertime meant swimming...EVERYDAY! We didn't have a pool in our backyard then , but we would go to the Bloomington Country Club pool! We would load up with our cousins, the Trumans...take a cooler of treats, get our nose plugs that looked like silly putty and head out! I can't really remember that sunscreen was the top priority it is now... so we all got VERY TAN! Sometimes for a really great treat we would all head up to Veyo pool. the corn dogs, cherry 7-ups.. and the wall of chewed gum... and the sign that said " welcome to our ool, notice there is no "P" in it...please keep it that way"...ahhh memories! My favorite was when my dad would come swimming with us! He would chuck us and let us dive off his shoulders he was the biggest kid in the pool. As I got to be a teenager... Las Palmas was THE summer hang out. My family bought a membership and we were there EVERY. SINGLE. DAY. I would go with my friends, but I had to take my little sisters and brother with me. We would be there from about 11:00 am to about 4:00 pm... one time we took one of Brock's friends... one of Brock's blonde- blue eyed, fair skinned friend. I wasn't very responsible with the sun screen. When it was time to go he was laying on the lawn chair with the towel wrapped around his sunburned eyes and face....OOPS! I later taught that kid in high school and on the first day I reminded him about almost killing him... He could remember...YIKES! There were diving boards, hot guys, fun music, and so many fun times. We ruled the world! This past week we were in St. George and swam every single day. My 78 year old grandma even came down from Cedar City to sun and float in the sun. One day my dad came home for lunch and ended up swimming with all of the grandkids. He had them laughing and crying all at once... just like old times. We had good treats, lots of cool drinks, & popsicles by the dozens... and this time the kids had sunscreen check every 30 minutes! 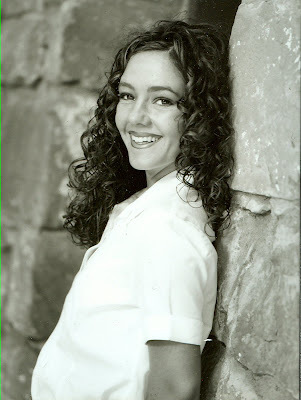 I was taken back in time... but, this go around I didn't look so hot in a swimsuit! Saturday night our phone rang at 1:00 am... never a good sign. Caylor answered it...said thank-you, got up and went and stood by our stairs. Then he came back in our room and went into the closet. 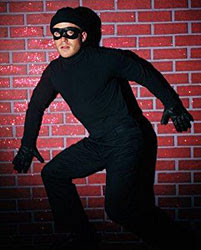 He came out dressed - carrying his gun and headed out into the dark house. I was totally confused and somewhat alarmed. Jackson heard some noises in our un- finished sub-basement that is below his room... he was too afraid to get up and way to afraid to call up to us. He grabbed his itouch and got on facebook to see who was available to chat. He found a little girl named Stephanie and messaged her to call our house and tell his dad that someone was in our house. She did and that was when Caylor got up. 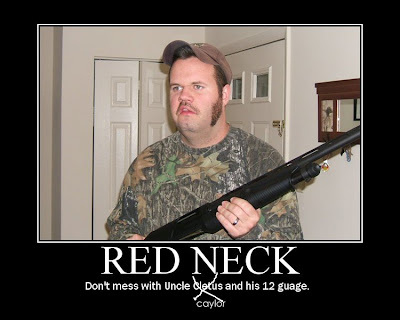 He also heard noises so he got dressed and grabbed his Winchester cowboy gun. He turned on lights out on our deck and then called 911.
one through the front door and the other was in our backyard. The one inside our house asked where our kids were and got a basic layout of our basements... He then took his gun out of the holster and headed downstairs... as he got to the bottom of our stairs he hollered out..." This is the (our city) police... if there is someone in there, make yourself known... you have been warned"
The other policeman found the bottom basement door open, but they couldn't find anyone. They "secured" the basement, checked every nook and cranny and left us to enjoy the night. Did I say HOLY CRAP? 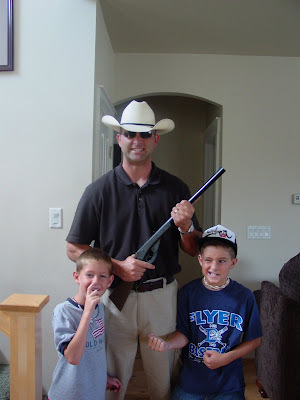 I don't know whether it was the wind, maybe my boys left one of the doors unlocked, or maybe someone really was there; and when Caylor started making all that noise and turning on lights he scared them away. I wasn't really afraid because Big Daddy was here, but sometimes I stay home alone. Nothing was missing...nothing was hurt... the basement did look ransacked, but it looked like that before- nothing a burlger did. If there was a burgler, they could have a least cleaned the storage room up. Today I am a little shaken by the "what could have happeneds"
I am so proud of Jackson that he thought to facebook someone... Even though he was so afraid, he stayed calm and had a great solution. I am glad that little girls stay up half the night chatting on facebook. I am not laughing and being glib... but it is good to find some kind of humor in everything. What is not funny... that my boys probably won't sleep down in their rooms for a while. The good thing that came from this is... I think ADT is getting a new client! Oh... and Bette is safe! As a family we all really enjoyed just hanging out. 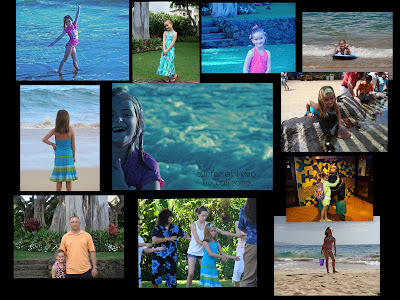 It wasn't a busy trip...lots of beach and pool time. I even attempted boogie board surfing...let's just say I got sand where sand isn't supposed to go and my bathing suit became somewhat of a sand bag...lots of sand between the liner and the suit! Caylor died laughing at me catchin' the waves. OK... so I am not so co-ordinated and athletic...but I did keep my earrings on. 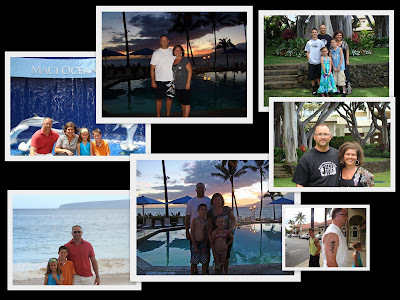 We stayed at the Marriott Wailea on Maui! Beautiful! We brought home so many wonderful memories that will last a lifetime... much longer than the henna tattoos we all got. 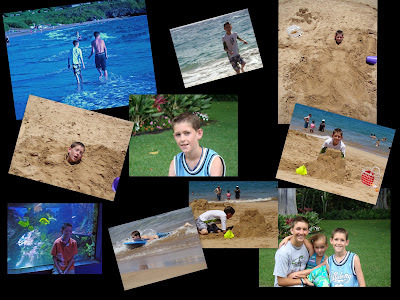 Mitch- The reason we went was so Mitch could go with his friend to a Just Win football camp in Maui. He was the the only freshman DB and 1 of 6 Howlies... needless to say when they did the Haka...he bailed to the locker room. He did great at the camp. One coach from UNLV thought he was a junior...It got him all excited for the upcoming football season! He was very impressed with all the other players tattoos... I think Mitch wants to be a painted man... he got 2 jaguar ink tattoos ( a tribal band and a mermaid) the first day we were there and then two henna tattoos ( a tiki tribal band and the same band as before) the day we left. It is a good thing they just lasted a few days. Mitch loved to snorkel and just hang out his buddy, Walter. He has an obsession with tank tops and sunglasses...the risky business kind. He was the hottest howlie on the beach! Jackson was the master of the beach! He built sandcastles, and even buried himself. He loved to boogie board...one time he totally wiped out and thought he was going to die. He quickly recovered and hit the surf again! Jacks was very interested at the Maui Ocean Aquarium. For a boy who won't even touch the gel for his hair, I was surprised he touched a starfish and a sea urchin. When we went to Big Beach and were watching the real surfers in the BIG waves, Jackson was more into catching sand crabs. 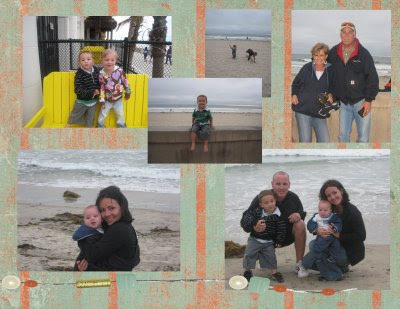 I could see Jacks growing up to be a surfer...marine biologist...ocean lover! 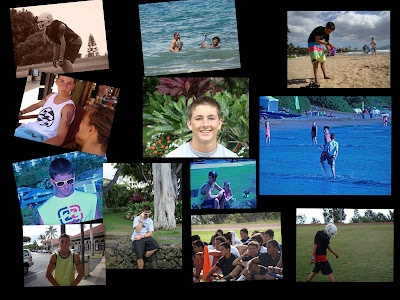 He excelled at the hang loose way of life! Meg wants to be the next Roxy babe on the beach. She loved the ocean...excuse me, the sea. She swam in the ocean or the pool most every day...ALL day! She really is a mermeg! She made several friends ...one from Alaska, Georgia, and California. She took hula lessons and wondered if instead of having a recital, they were just going to let her perform at the huge hotel beach luau. She was mad when it was only a half hour lesson and she only learned one dance. Although, she was jazzed with the certificate that was delivered to her room later that night. It gave her Hawaiian name...MeKana. She is thinking about changing it legally, or for the second grade at least. She loved everything about the islands and was our cutest little hula girl! We had a great time... didn't want to come home! It really was a vacation of a lifetime! I am so lucky to have such amazing sisters! I think she takes the photo and has it in a scrapbook within 24 hours... unlike me who has is in the book... oh yeah...never! She is the best mom to her two boys... Jace and Briggs! 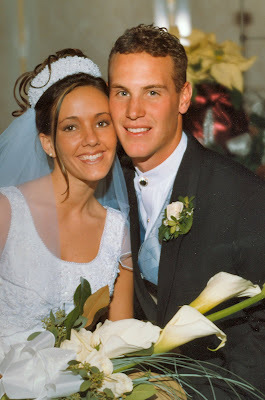 She is married to a real hottie... Ryan! Their wedding was glamorous...like a wedding on a soap opera. She is beautiful and talented! 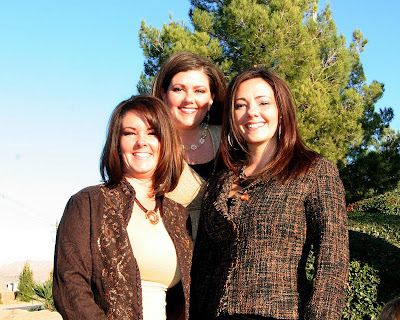 My other sister Jody and I donated our singing talent to Brandy. It is better for one sister to sing REALLY well than for three sisters to kindof sing. 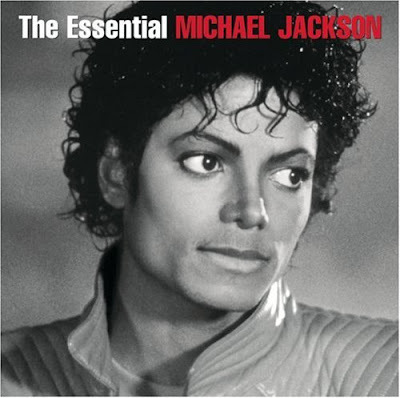 Today I bought the Essential Michael Jackson album from itunes and have listened to it all day. I am sad that he had to become such a freakish side-show! Why couldn't he have just stopped when he was still black and still had a nose. I was somewhat saddened by the loss of such a musical genius. But then, as you look back through time at all the creative geniuses the world has produced, most of them were freaks in one way or another. As I listened to some of those songs I was totally taken back in time. I even had to pull up YOU Tube to watch the We are the World video. ( It was amazing to see the not so surgeried Michael Jackson AND Kenny Rogers) I also watched several of Michael's music videos. Wow what an amazing dancer. I Loved my little stroll down "before Micheal was so damn weird street"! I felt the need to discuss, so I called my Pop-Culture Guru friend, Mindi, and chatted about the freak he had become. I knew that Caylor would have absolutely shut down any conversation starting with " wow, today I was thinking how sad I am that Michael Jackson died, but even sadder that he became such a freak". Mindi helped me talk it out and I don't think I will seek therapy over the loss. The album is amazing! So many memories from my own life! Too bad his bazaar behavior had to overshadow even his music in the end. I am just wondering how many times I can have the word "freak" in one post? But, then when talking about Michael Jackson... there aren't any other words that quite work. So... Go listen to the Essential Michael Jackson...grab your crotch, wear a glove, and get your freak on!